How Much Does it Cost to Run a Children's Home? 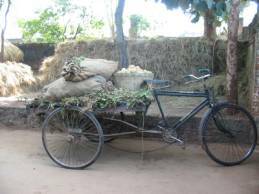 Bicycle Cart at Talmu for Hauling Produce to Market We help support children's home projects around the world. This is the Talmu Boys Home located at Ananda Nagar, in West Bengal India. 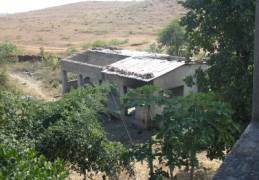 This home is typical of the our children's homes thoughout India and will give you an idea of what life is like for these children. These homes give children opportunities for education and self-development that would not otherwise be available to them. The monk, Dada Devapremananda, has run this project since 1998. As well as being in charge of the home he is it he principal of a junior high school with 112 students, and supervises 6 other primary schools. The home, built in 1988, consists of 6 rooms downstairs, which house the 9 boys. 5 years ago a second story, consisting of a meditation hall and a room for the superintendent was built. A few years ago the roof of the kitchen was destroyed in a hurricane. There are toilets outside, but no running water. Most of the time they go out to the fields. The boys spend part of their day working in the fields, but aside from a small amount of money made from occasional vegetable sales, the home is subsidized by donations. Typical meals at the home are as follows. Breakfast consists of boiled rice with potato, puffed rice with molasses, or soaked/boiled chickpeas. Lunch is rice with pulse and vegetables, and dinner is rice, sometimes chapattis and vegetables. To feed 13 people they consume 22 pounds of rice per day! In addition to their regular maintenance, this particular home needs funds to build a boundary wall (in India people will grab your land if you don"t have a boundary wall), repair the kitchen, buy a cow, and purchase electrical poles as they are presently running loose wires (240 volts), 150 meters from the main building to the irrigation well to connect their pump. Uma Nivas Girls' Home The Uma Nivas Girls' Home is part of a larger women's community development project started in 1985 that seeks to empower women to take their rightful place in society, help them to better care for themselves, nurture their families and support their communities. Uma Nivas means "Abode of the Universal Mother". In addition to the Children's Home which presently houses 23 children, the project includes three primary schools and a girls' high school. There are girls' hostels to accommodate children from outlying villages, who could not otherwise attend school due to difficulties of transportation. Apart from the Uma Nivas Girls' High School, there is no girls' high school for miles around.